iSTAR Pulsar+ capture data that has been downloaded directly from the device to external drive can be processed in our Immersive Studio software for Windows. 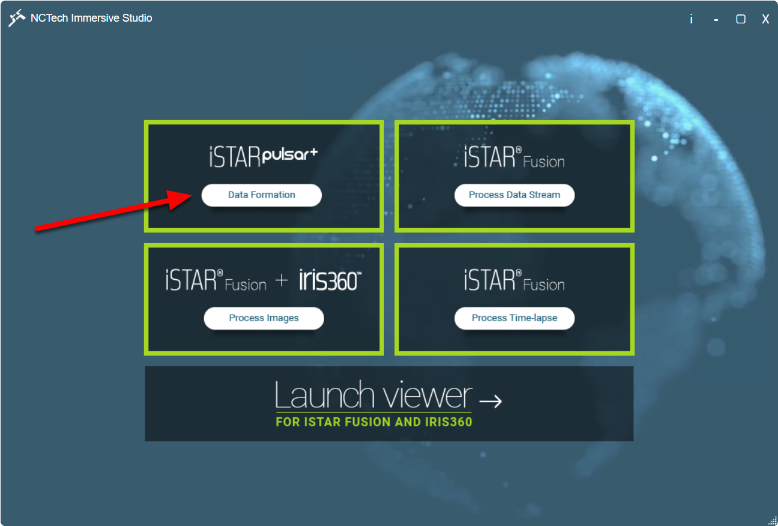 This functionality was added to Immersive Studio in v10.0.4, released 20th February 2019 - users with older version must upgrade to allow for the processing of iSTAR Pulsar+ data. Distance Spacing: By default, only images 4 meters apart are extracted from a capture and processed. This option allows users to increase/decrease the spacing as desired. Example: If set to 8.00 images are processed every 8 meters apart. Image Count Spacing: If set to 1, images are processed at 7fps. 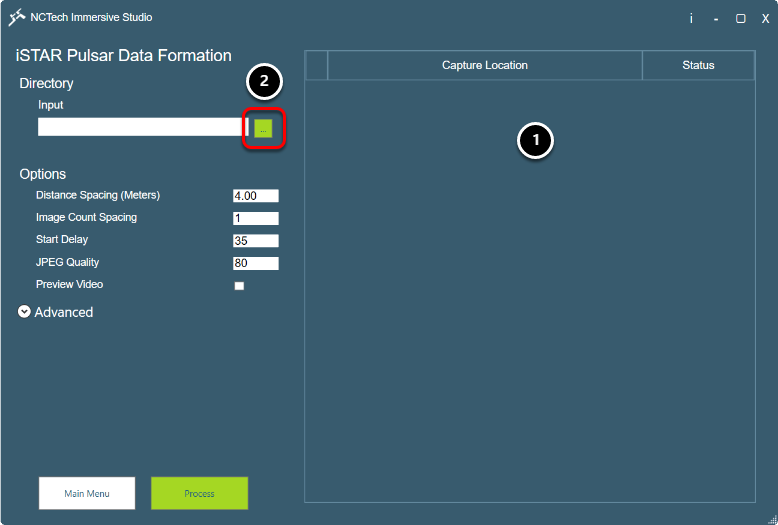 This option allows users to change the frame rate at which images are captured. Example: If set to 7, images are captured at 1fps. Note: You can ONLY select either Distance Spacing or Image Count Spacing. If both are selected an error will occur. To set Distance spacing, leave Image Count Spacing at 1. To set Image Count Spacing, set Distance Spacing to 0. Start Delay: The number of frames excluded from the start of the capture, these are normally unusable due to the device still finding an appropriate exposure value. Default value is 35 frames. JPEG Quality: Default is 80 giving a good balance of small file size with minimal compression artefacts. Set to lower number to reduce file size but compression artefacts will increase. Setting a higher number will increase file size with minimal reduction of compression artefacts. Preview Video: Enabling this results in a 2K x 1K preview video of the capture being output alongside the individual frames for reviewing purposes. Create JPEG images: Default option, processed images are output in .jpg format. 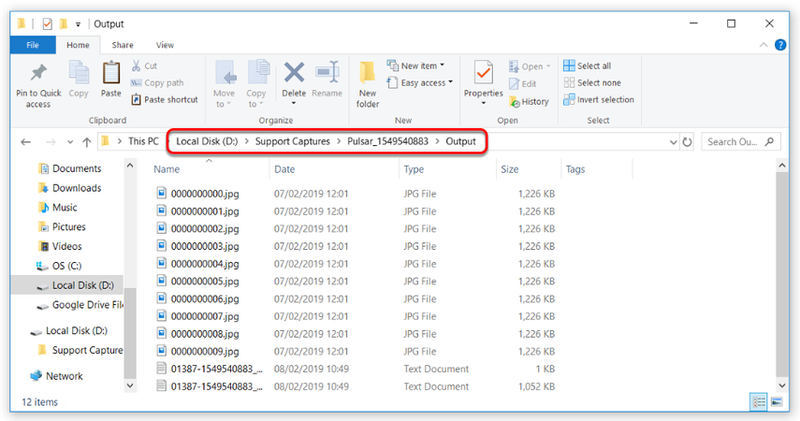 Create PNG Images: Processed images are output in .png format. Users may choose to output in both formats if desired. 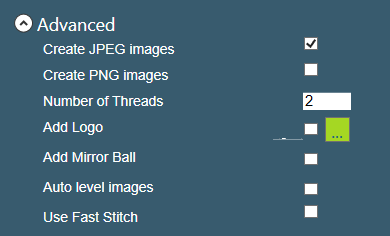 Number of Threads: Dictates the number of processing threads dedicated to the image stitching. With systems having 32GB or more of memory, this can be increased to 4 which will reduce processing times. Add Logo: Allows users to enable/disable the adding of a logo to the bottom of the imagery, and to specify a custom logo for this purpose. Add Mirror Ball: When enabled, places a "mirror-ball" effect at the bottom of any processed imagery. If both Logo and Mirror Ball are enabled then the logo will sit on top of the mirror ball. Auto level images: When enabled, any imagery captured that isn't quite level will be auto-corrected during stitching. Auto level images is a Beta feature, meaning that while it is accessible within the interface, it remains under development. This is only suitable for use with vehicle mounted captures, and only for standalone imagery - users wishing to synchronise their data with external systems of any kind should ensure that this option is disabled. Use Fast Stitch: This allows images to be processed without full blending. The time to process is reduced but the image quality is degraded. I'm experiencing Wi-Fi issues with my iris360 device, how do I address these?